Air-operated clamp comes down holding sticks firmly in place. After workpiece is clamped, table start to feed, performs trimming and shaping operations. The sharper spindle is precision-constructed for cutting finger, tenon shapes accurately and accommodates a maximum cutter diameter up to 6″. 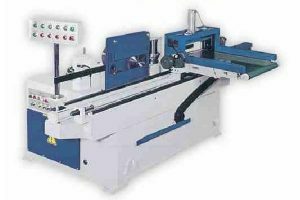 The table traverse is driven by hydraulic power system, ensuring very stable, smooth workpiece feeding. Thus, an accurate, fine cutting result is guaranteed. Shaping Speed 2.5 Times / Min. 2.5 Times / Min.